Revani is a delicious, cake-like dessert soaked in syrup. It’s widely known in Greece, Turkey and generally in Mediterranean and Middle East countries. 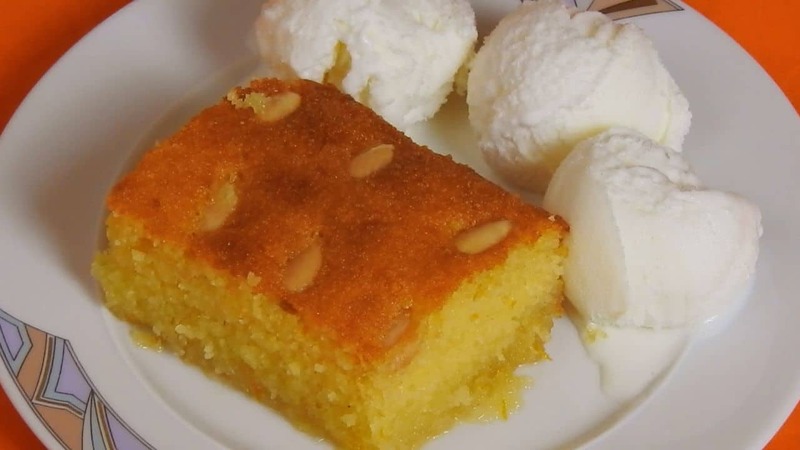 Except from a cake’s main ingredients (butter, eggs, sugar, flour) it contains yogurt and semolina. Variations with ground mastic of Chios or shredded coconut in the batter, are very popular. Depending on the recipe, the syrup can be simple or flavored with lemon peel or rose water. In this recipe, yogurt is replaced with fresh orange juice and the result is a lighter texture that can absorb the syrup better. It’s fluffy, juicy and full of orange flavor. Try it cool from the fridge next to a big ball of “kaimaki” or vanilla ice cream! In a large mixing bowl, beat the butter with the sugar until you have a smooth cream. Scrape down the sides of your bowl every few minutes. Continue with the vanilla extract, the orange juice and the orange zest. Add the semolina and mix well. Sift the flour & the baking powder and add them to the mixture. Transfer the batter into a buttered & floured baking pan, rectangle 26 × 34cm/ 10 × 13inches (or round 32cm/12,6inches in diameter). Smooth with a spatula and decorate with the almonds. Bake in a preheated oven, at 180°C/350°F for 35 to 40min until it’s golden brown. The right moment to pour the syrup over the cake, is when the cake is still warm and the syrup is still hot (not boiling). So start preparing the syrup, the minute you take the cake out of the oven and not sooner. Take the cake out of the oven and set it aside for the moment. In a medium saucepan, combine the sugar with the water. Add the lemon juice and the lemon peel. Stir well & bring to a boil. Count 2min from the moment it starts to boil and remove it from the heat. Wait for 15min and cut the cake into pieces. Using a ladle, pour the syrup slowly & evenly over the cake. If you’re patient enough to refrigerate it for a couple of hours, you’ll like it even better! The best way to serve it, is with “kaimaki” or vanilla ice cream.